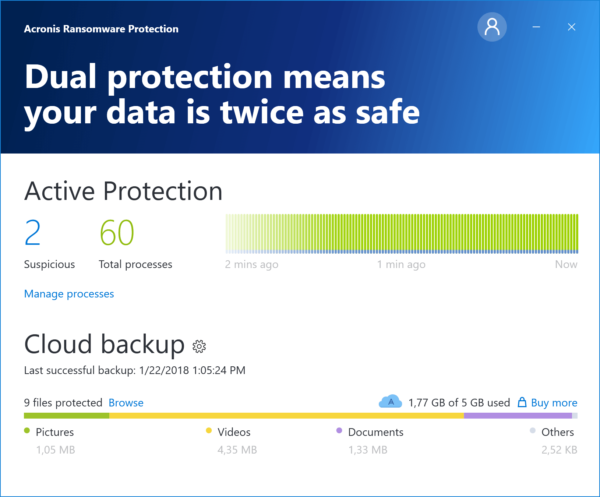 Acronis, the folks behind the well-known backup software, has come up with a free program today that lets users ward off dreaded ransomware before it hits their PCs. Called Acronis Ransomware Protection, it monitors system processes in real-time to detect and stop the attacks, which typically encrypt users’ files and force them to pay a ransom to have their PCs unlocked. The new software also comes with cloud backup, so users get up to 5GB to store a copy of their files on Acronis’ cloud storage service. The program, requiring only 20MB of space and using limited resources, aims to do its work without hoarding up a system. Ransomware Protection relies on cloud-based artificial intelligence to look out for malicious malware. It regularly analyses hundreds of thousands of processes online to “learn” how to spot a suspicious one, according to the company. In the event of a ransomware attack, it blocks the malicious process and notifies the user with a popup. If any files were damaged in the attack, it promises to help recover those affected files. Acronis first made its name with its backup software, which in recent years has been extended as a cloud-based service for consumers and businesses to safely and easily create a copy of their most important files. The Singapore-based company now offers anti-ransomware as part of a package of software tools to protect against not just cyber attacks but also unforseen breakdowns, say, in a hard disk. Ransomware Protection is one of an increasing number of free tools that users can tap on (see a useful list here from PC Magazine). If you’re worried about being hit by something similar to last year’s ransomware attacks, these are the apps you have to be checking out.